Do you remember when you first heard about autism? I don’t. I’m fairly certain it was long before I ever became a parent, but I don’t remember exactly. I find the same to be true of most parents that I talk to. We just don’t bother learning about it because it doesn’t pertain to us, therefore, it doesn’t interest us. Until we have a child with autism. Then we have no choice. But what if we had learned about it before the fact? I think, and it may be just me, that it would have helped me immensely to know more about autism before I had to. Now, as recent events teach us, elopement, or wandering, is far too real and it happens far too frequently. Both Mikaela Lynch and Owen Black were found within one week of each, on opposites sides of the US, in water… dead. All it took was a split second, their parents lost sight of them for just a split second, and they were gone. Have you ever looked away from your child for more than second? I know have. A lot. In fact, I’d wager that it’s pretty much impossible to have your child in your line of sight at all times for years, much less decades. But these aren’t the first children to wander off. They aren’t the first to be found in the most tragic way possible. And unfortunately, they very likely won’t be the last. And the reason, I fear, is that many people will read these stories with a heavy heart, feeling much sorrow and then moving on and not learning more. Because it doesn’t pertain to them. It doesn’t interest them. This isn’t something that you can put off or dismiss because it doesn’t interest you. This isn’t something that you should wait to learn more about until it happens to you. If the deaths of these innocent little children is to mean anything, I would hope that it serves as a lesson to the rest of us to not wait… to not let it happen to us and then wish we had learned more earlier. The National Autism Association has taken action to help people be proactive in learning more and being prepared now, not later. Their Big Red Safety Box is a great start in preventing these tragedies from hitting much closer to home than you’d like. I strongly advise that you either take them up on this offer or at the very least, read about it, learn about it and prepare in your own way. I don’t know the families of the children and I don’t know exactly what happened on those days. I do know, however, that this could have happened to anyone. No one is to blame. No one is at fault. What those people need is support, a shoulder, a hug. No media circus, no questions about how they could have let it happen, no accusations, no guilt. If it had happened to me, I’d be devastated. I’d be furious. I’d be at my lowest. But it could have happened to me. It could have! And I have no idea how to prevent it. Because until now, I’ve read the news stories and in time, forgotten them. Because until now, I kept thinking that it was just something that happened to other people. I sit here, wondering if those families were like me. Dismissing the stories, forgetting the lessons… until it happened to them. Did they know about autism before their child’s diagnosis? Did they know about how often children with autism wander away from safety and into danger? Did they know how often children with autism are found later, dead, in water? I bet they know now. All too well. Not just about their own child but about the facts, the figures, the statistics. I’m not Mikaela Lynch’s dad, but I would like to think that if I was, I’d want other dads to learn to not put off learning, to not dismiss the lessons being taught this day and most importantly, to not forget. I put off learning about autism until I had no choice. 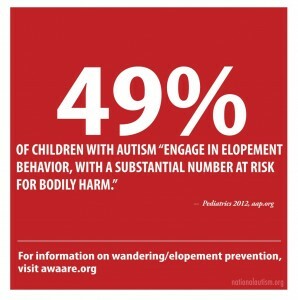 I’d hate to think how I would feel if I put off learning about autistic elopement until it’s too late. I’d hate to think that I had learned the risks and learned the steps to avoid it and had the chance to take it… but forgot and failed to prevent it. I certainly can’t speak for the families of these children nor any families that have gone through this previously but I would like to think, if there was anything those people could hope to come from these great tragedies is that the rest of us learn to not wait until it happens to us before we decide to do something about it. I know that after this – I am going to do more. I too was one of those parents who read the stories and cried and then moved on…I can’t now. It’s just too much.